Dickson Lake, located in Algonquin Provincial Park, Ontario, is a remote, oligotrophic lake, where cyanobacterial blooms of the genus Dolichospermum (Ralfs ex Bornet & Flahault) P. Wacklin, L. Hoffmann and J. Komárek were reported for the first time in the fall of 2014, and subsequently in the late spring of 2015. 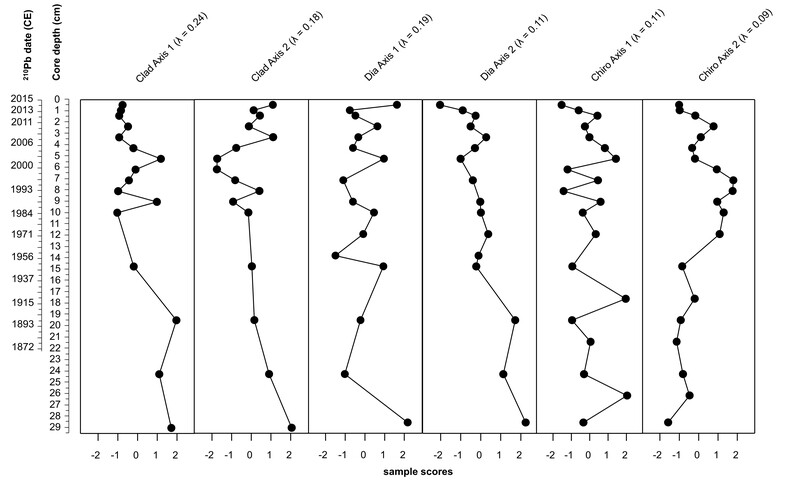 To investigate the potential environmental triggers of these bloom events, we assessed long-term trends in water quality using a multi-proxy paleolimnological approach, examining sedimentary diatoms, chironomids, cladocerans, spectrally inferred chlorophyll a, and cyanobacterial akinetes preserved in a 210Pb-dated sediment core. Assemblage changes were modest in all biological proxies. 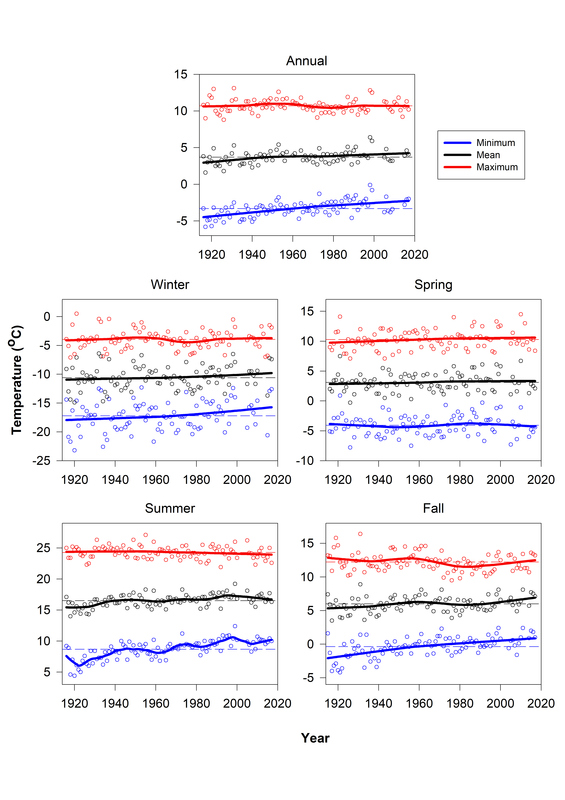 A subtle increase in the abundance of warm-water chironomid taxa (Topt > 15 °C) commences in the year ~ 2000, with further increases in the most recent years of the sediment record (~ 2013–2015). 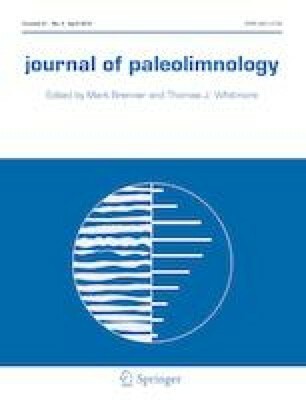 End-of-summer volume-weighted hypolimnetic oxygen concentrations (CI-VWHO), inferred from chironomid remains, reveal a decline in oxygen concentrations over the last two decades coincident with the highest levels of sedimentary chlorophyll a and cyanobacterial akinetes in the sediment record. These paleolimnological findings corroborate observed reports of the onset of cyanobacterial blooms in Dickson Lake in late 2014 and are consistent with increasingly favourable bloom-forming conditions over the past few decades that are related to warmer air temperatures, sharp declines in wind speed, and a lengthening of the ice-free season by 2 weeks since 1975. It is plausible that late ice-out and a quick onset to stratification in 2014 may have resulted in incomplete spring mixing, early onset of hypolimnetic anoxia, and increased internal nutrient loading, that, occurring during a period when climate conditions were particularly ideal for cyanobacterial proliferation, may have fueled the unprecedented algal blooms in this remote lake. Collectively, the factors causing algal blooms in remote lakes such as Dickson Lake are not yet fully understood, and it is worrisome that with continued warming the triggering conditions may become a more common feature of Algonquin Park and other minimally impacted Boreal Shield lakes in the coming years. The online version of this article ( https://doi.org/10.1007/s10933-019-00074-4) contains supplementary material, which is available to authorized users. We thank two anonymous reviewers for their constructive comments on the manuscript. Ontario Ministry of Natural Resources and Forestry staff are thanked for assistance with field work, and Alison Lake and Glenn Forward in particular. We also thank Ann St. Amand and PhycoTech, Inc. staff for conducting the akinete analysis, Ron Tozer for lake-ice records from Lake of Two Rivers, Trevor Middel and the Harkness Laboratory of Fisheries Research for bathymetric data, and Rory MacKay for information on the logging history around Dickson Lake. This work was funded by a Natural Sciences and Engineering Research Council CREATE grant awarded to J.P.S, a Discovery Grant awarded to A.M.P., and a CGS-M awarded to E.J.F.